hmmm how shall i begin? Dinner at District 10 was, regrettably, the worst dining experience for a pair of food kakis by far. Never did we anticipate things to escalate this way. 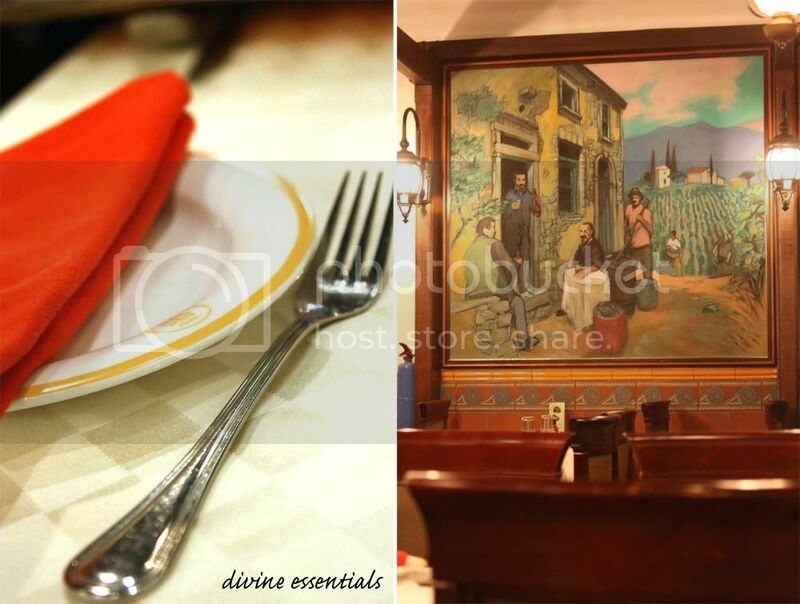 One thing's for sure, the central dining section was tamed for a charming alfresco atmosphere. But with null reservations, (not that we didn't try..we were told reservations were full) you get assigned to a desolate area blending with the former school's common premises. It just felt... improper. 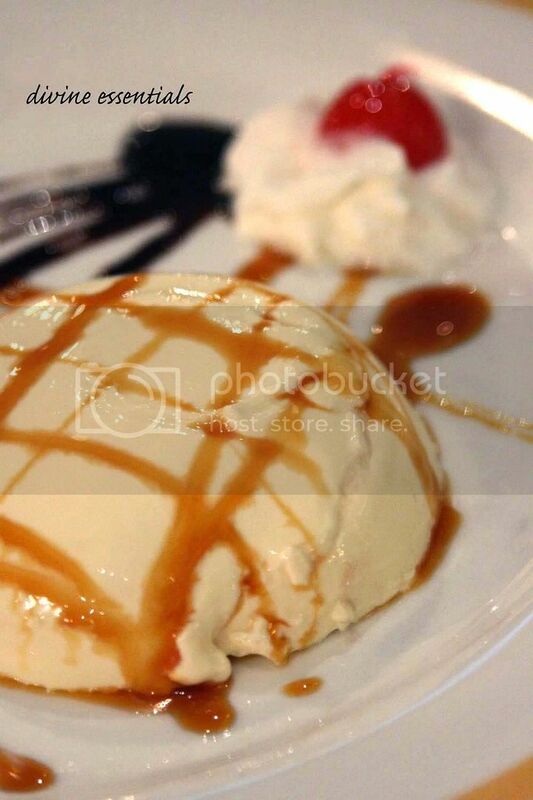 Have you ever ordered a dish for a particular something, but to your dis-delight, the thing never showed? I could find greens, marinated mushrooms, feta cheese, roasted roma tomatoes, parmesan flakes and bland balsamic dressing in the District 10 Salad ($12). Everything but walnuts. Boo. The chef's signature Country Style Roasted Baby Back Ribs ($24) served with fries, had no typical barbeque/marmite/honey sauce slathered. Instead it employed a risky crust of wholegrain mustard, which happens to not be everyone's cup of tea. In this case my friend was shunned off by the wasabi-like pungency. Now for the serious rant. Because Lemon Sole ran out, i opted for the waiter-recommended Fish of the day ($25)- checked and double-confirmed to be a grilled RED SNAPPER fillet. 1) The fish was obviously NOT a snapper. Any fish-eating person can tell it's salmon. 3) The noodles were maggie/wanton-meeish in character and awfully drowned in grease that it scares me. A spaghetti at least, could have saved its image by a million counts. 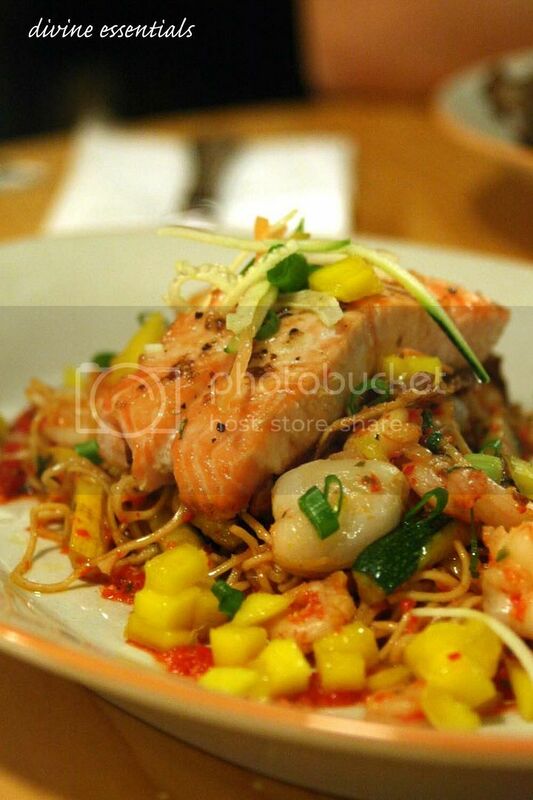 4) Effortless toss of shrimps, mango & lychee in thai dressing failed to abide. Everything just didn't flow into a cohesive picture. I never felt so compelled to oppose a dish to this extent, really. Project Dessert-to-the-rescue didn't suppress our grouses. The White Chocolate & Strawberry Cheesecake ($10) fared mediocre atop gritty digestive base and melted down to a pannacotta mush in a short timespan. Only liked the accompanying wild berries compote. When time to exit, the card system was down. You could only pass if you're (i) an american express cardholder, (ii) cash loaded. The sticky issue only resolved after a 30-minute long haul. Our fish dish was eventually voided & the manager gave a brief apology. 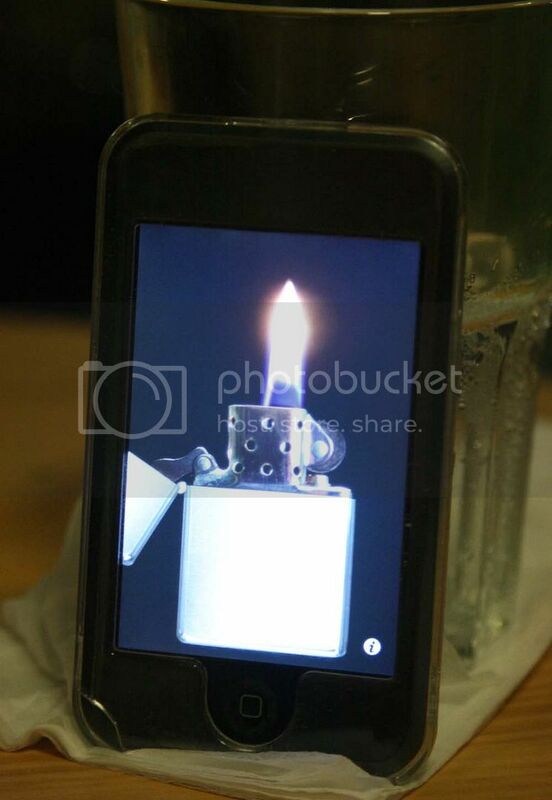 here's what kaki came out with to make up for the absence of a candlelight haha! When such bad scenarios slaps at you, you can only fall back on the quality company for the meal. My kaki agreed. Phew i made it here just before August swerved away. 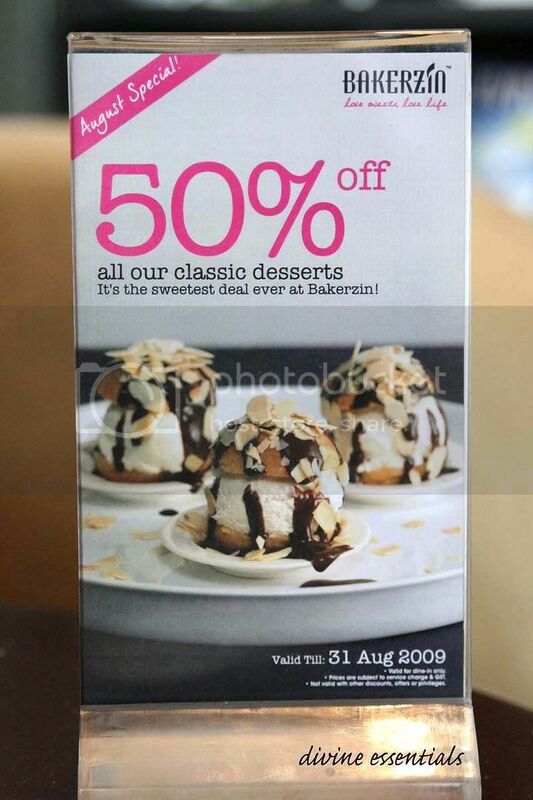 The 50% offer on all classic desserts is too tempting to resist even if food/service is bound to displease. 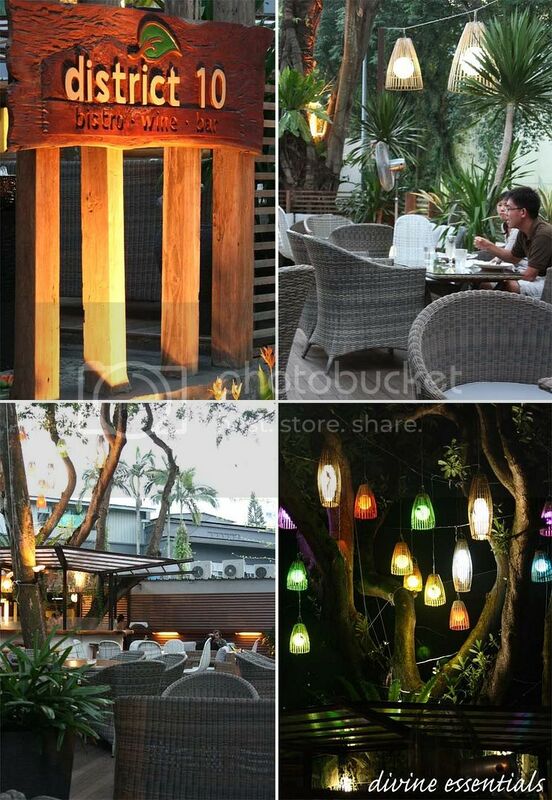 Accruing to that, chew on Bakerzin's newly revamped menu. Mimicked after a magazine publication. 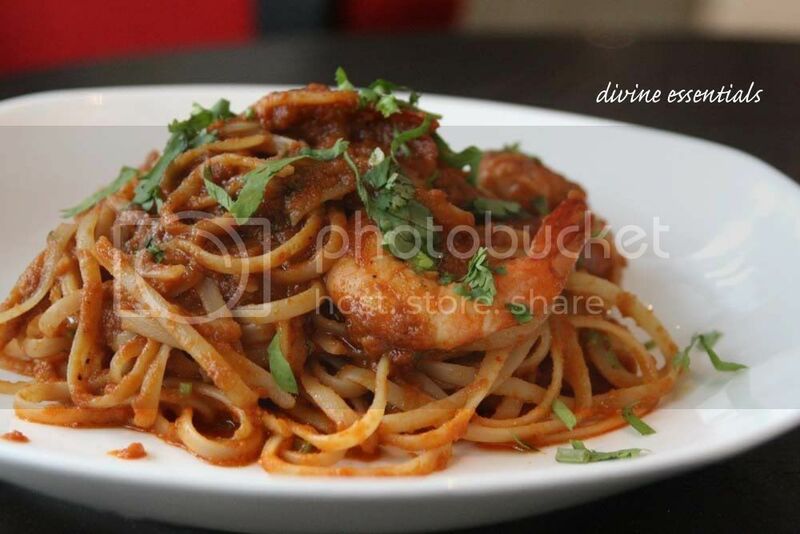 Here's the Assam Prawn Linguine ($13.80) looking so deceptively harmless. I like the fact it came with 5-6 sizeable prawns, but not the reality of encountering shell traces. The big picture: spill some concentrated assam paste over pasta and there you got it. In attendance of Trio of Bruschetta ($9.80), 2 out of 3 screwed up. I saw no wonder in cheese & tomato blanketing wet bread; and would rather have plump juicy mushrooms on bruschetta than these oil-logged mushroom chips (poor juices got expelled). Spicy otah ciabatta was best among them but also excessive in grease. Lesson to learn: Please TOAST breads! 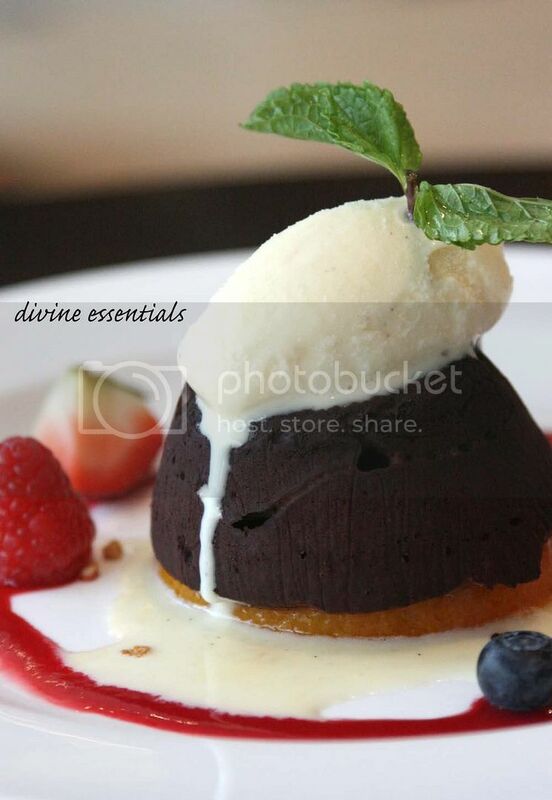 The signature Daniel Tay-prided Warm Chocolate Cake ($4.90 after discount) now sits on a slice of flavour-boosting orange confit and continues to promise molten outflows. Bakerzin is only great for DESSERTS. 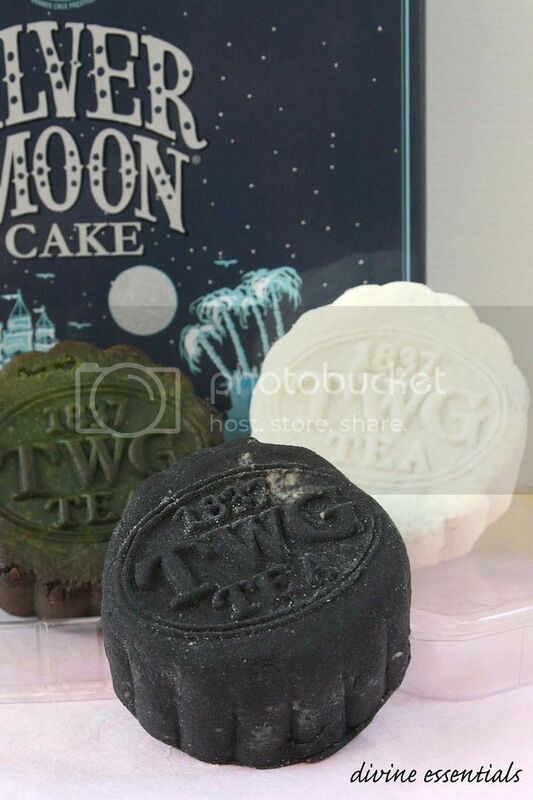 TWG's inaugural creations are awesome. They don't excel in visual appeal with eeky colors & shoddy workmanship, but their brilliance in flavours surpassed. We swiped right into transaction after sampling! The baked varieties include Green Tea with Durian, Crystallised Orange with Chestnuts & a nobody-would-decline Dark Chocolate. Snowskins come in only Black Tea or White Tea, and a box of any four is yours at $48. My favourite had to be this one. 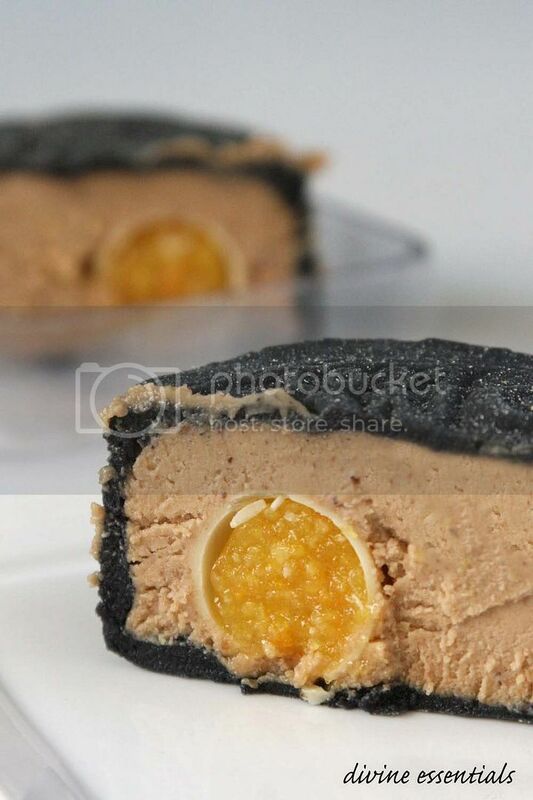 Shimmering black mooncake filled with luscious praline custard cream and a heart of orange marmalade. It's skin is subtly infused with 1837 Black Tea and showered with pretty silver dust.... Love at first bite. 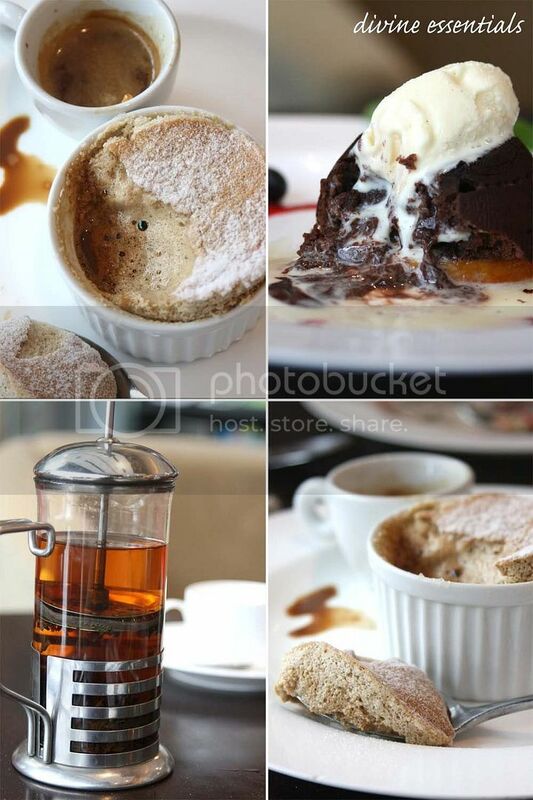 The White featured pure chocolate mousse in 1837 White Tea skin and a blackcurrant marmalade to go within. You could claim anything praline is infallible, but i'll prefer to say anything praline in mooncake is absolutely divine. Anyways. The Takashimaya Mid-Autumn Festival fair is an ideal pitstop with almost every reputable mooncake-dealers participating. It ends on 4th October so be sure to catch it if you're high on MCs. 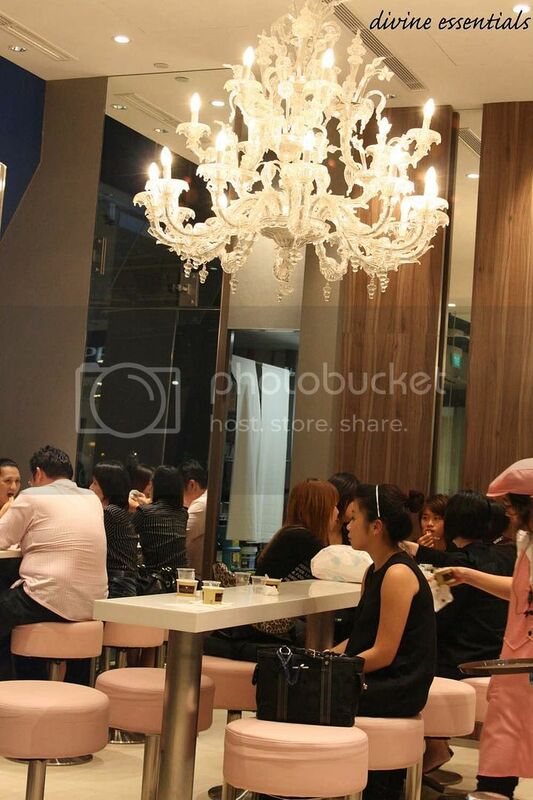 You might even settle a meal full of samples there lol. Happy mooncake shopping! Ugliness aside, quiches still make a comforting start for any weekend. 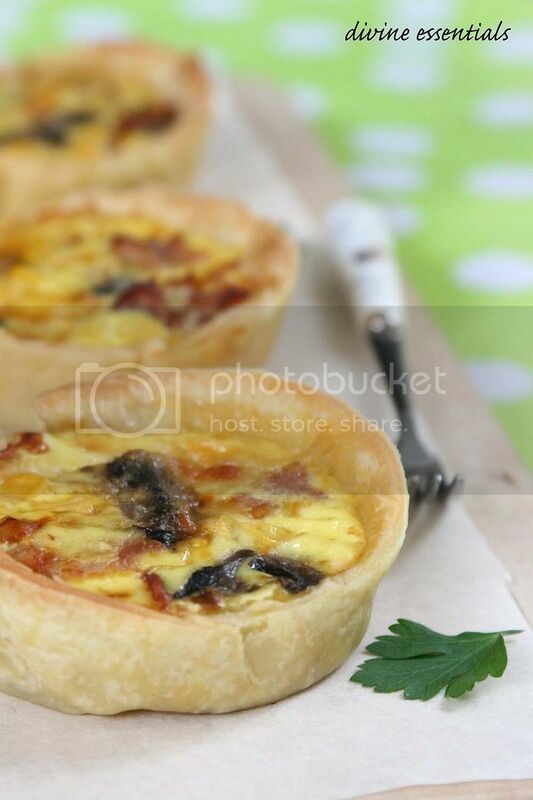 The assemble of crisp bacon, butter-sauteed button mushrooms & sweet corn kernels within a rich egg+cream+cheese custard tastes especially gratifying when fresh off the oven. Here's my messy take. I adapted the body from a classic Quiche Lorraine recipe, inserted my choice of fillings, then fixed everything over Michel Roux's Flan pastry. 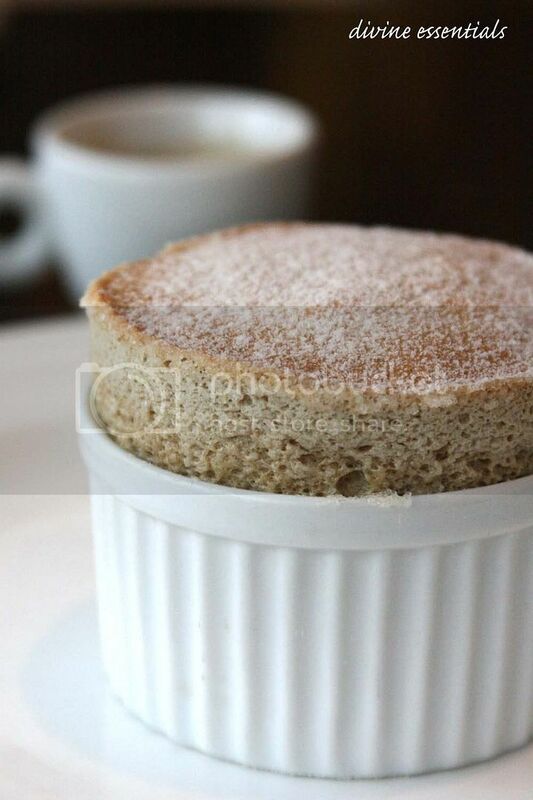 His pastry recipes are always pretty dependable. Just don't forget to blind-bake them with the appropriate weights! To make the pastry: Put the four into a mound on a work surface and make a well in the middle. 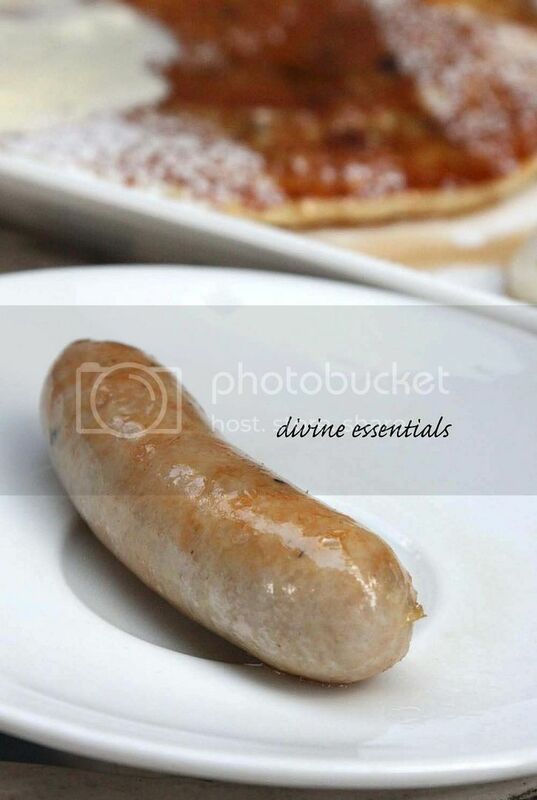 Put the butter, egg, salt & sugar into the well. Using your fingertips, mix all the ingredients in the well together, then gradually draw in the flour, little by little. 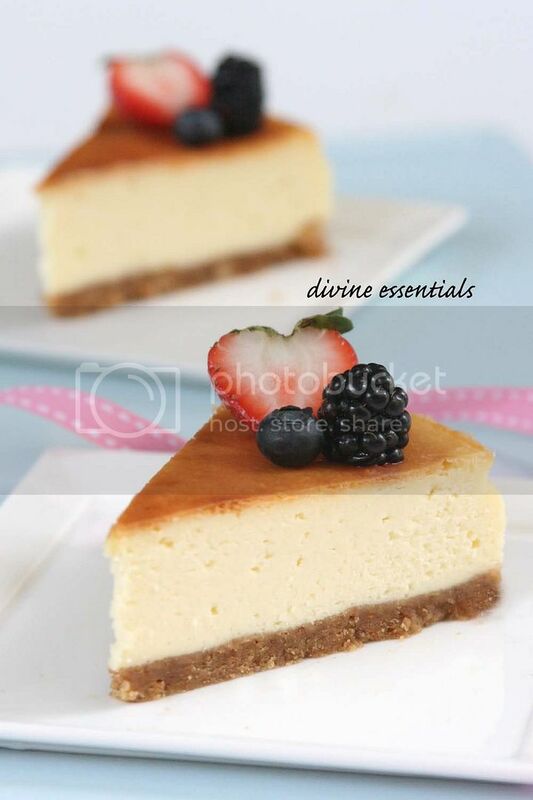 Mix until all the ingredients are almost amalgamated and the pastry has a slightly sandy texture. Add 40ml cold water and incorporate, using your fingertips. Knead the pastry 2 or 3 times with the heel of your hand to make it completely smooth. Roll it into a ball, wrap in cling film and rest in the fridge for 1-2 hours before using. Roll out the pastry thinly on a lightly floured surface, cut out accordingly and line the tart tins. Prick the base, then chill for 15 minutes. Blind bake in a preheated oven at 200C for 5 minutes. To make the filling: Panfry bacon until cooked and fragrant, drain on kitchen towel. Saute mushrooms in butter till moist. 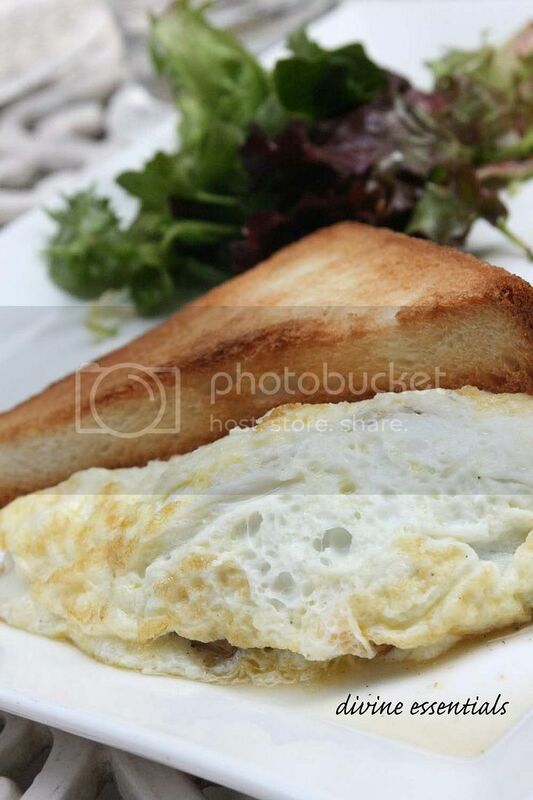 Put the eggs and cream into a bowl, beat well, and season with salt & pepper to taste. 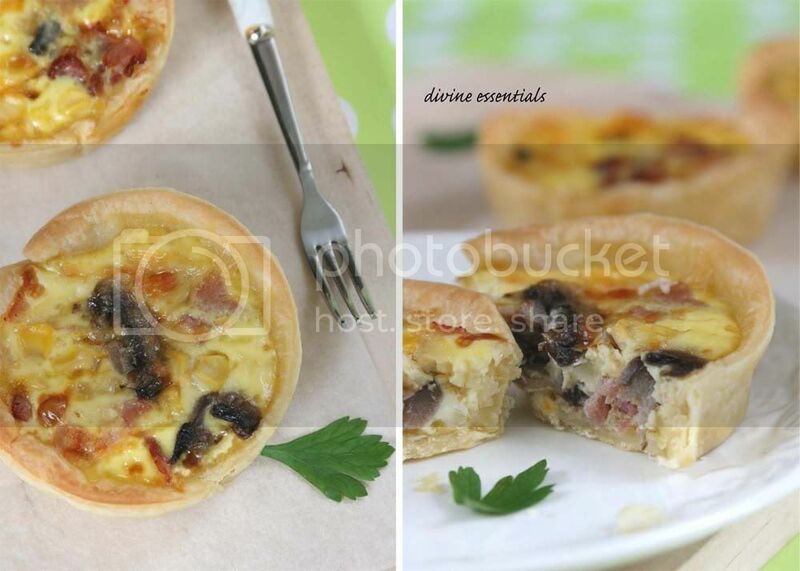 Divide bacon, mushrooms and corn kernels evenly among tart shells. Sprinkle grated cheese over, then carefully pour the egg mixture over. Bake at 190C for 20 minutes until just set and browned. Serve warm. 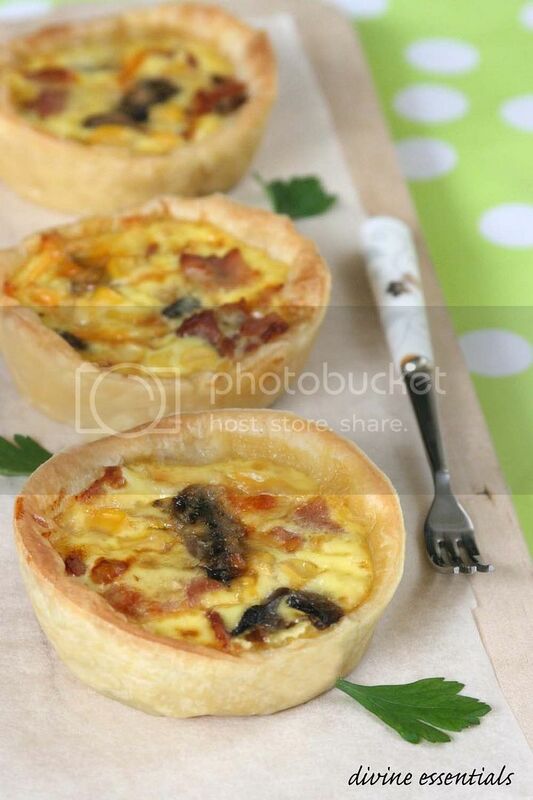 Try having a quiche for breakfast one Sunday! but it's no love declaration for their gelatos. Not that they're any short of L-O-V-E. Binding the gelateria chain together is a riveting love tale between two Korean food-passionists, their affinity in culinary school, a gelato-making course & 230 ideas. They have a couple of inconceivable flavours like can-you-believe-it?! rice, white wine, masala chai tea, cereal milk chocolate, panna cotta, vanilla cake... yada yada. Almost one cup too many. You'll probably take more time thinking of what goes into your cup than the speed it empties! Here's my no-nonsense triple scoop cup ($5.90) capped with a cute mini cone. I could lap up easygoing yogurt anytime, bear with the slightly awkward walnut, but i refuse to swallow all of vapid kiwi bleah. 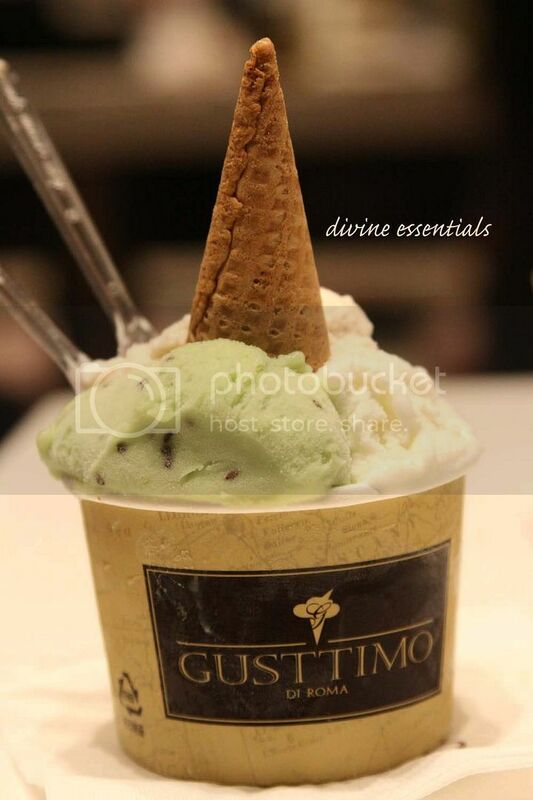 Gusto= eating with gusto, Ottimo = savouring the ultimate flavour. When food doesn't fully satisfy (ie. i did not eat with gusto lol), at least they have pretty interiors to dwell under...and plenty of flavours to ponder about. My impressions of this unheeded company stagnated after a plate of fried mee suah-alike capellini. That was a year ago at their peaceful siglap outlet. Despite that minor trauma, the appeal of homemade pasta still pumps my courage to revisit... And im elated to say, the Bukit Timah store has single-handedly restored my faith. Kudos. 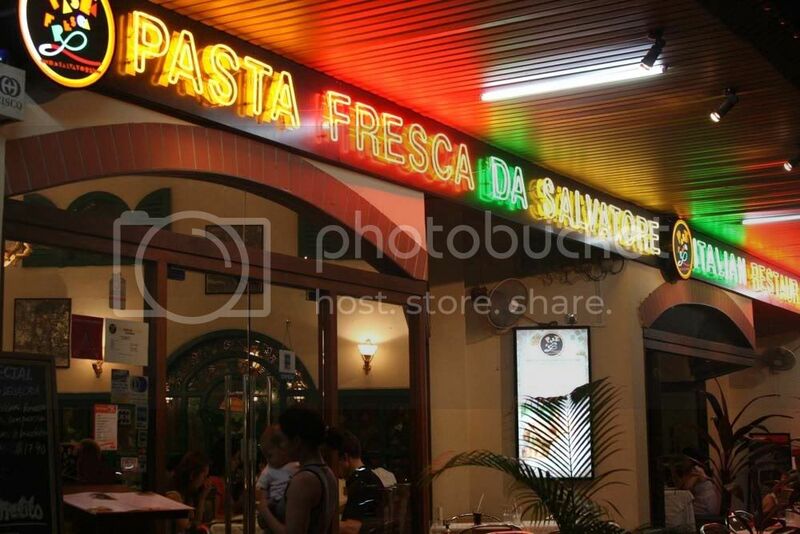 I love the concept of Pasta Fresca. 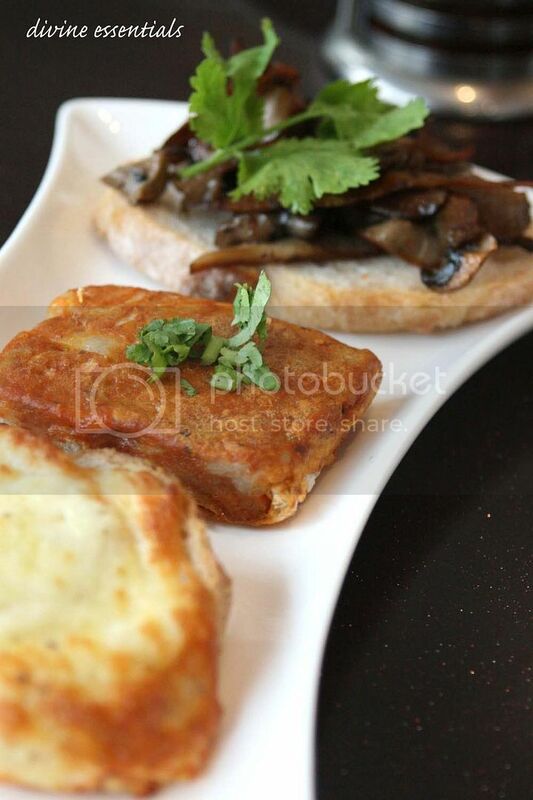 Every order is built from two parts, where you first select a sauce base followed by your choice of pasta. No rules, no pre-coupled restrictions, you're basically the designer of your own. They have close to 20 pasta varieties (various shapes & forms) available, out of which gnocchi and raviolis included. All guaranteed fresh and produced in their central factory daily. 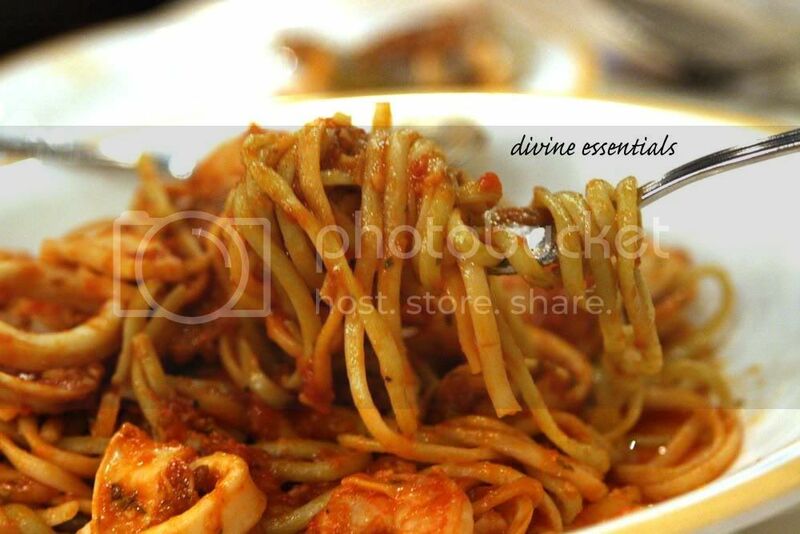 Can't say much about the Spaghetti Alla Pastora ($15.90) cos my fork barely touched it. 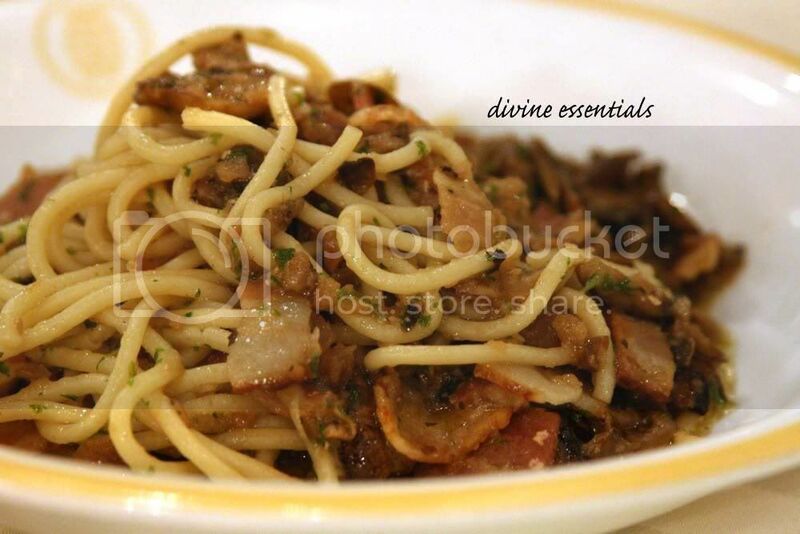 Except it is bacon & mushrooms tossed in a tasty saute of olive oil, garlic and chilli. Or why not just say bacon aglio olio. 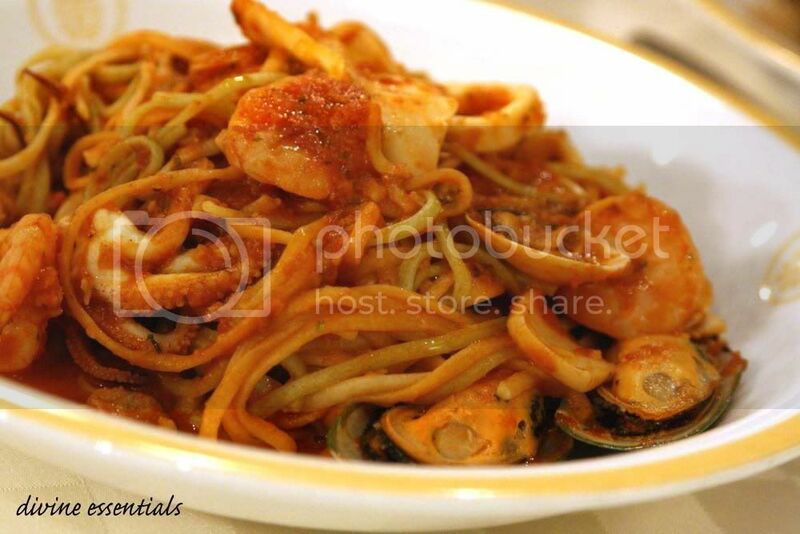 In part i was distracted by my Linguine Alla Marinara ($18.90)- a plethora of prawns, squid, clams & mussels bathed in a robust tomato sauce. Which was delicious. Also offered in white wine sauce but trust me, the Reds take the victory here. The linguine i picked appeared in a trio of colours (regular, spinach & carrot if my guesses are accurate), softened past aldente point but jammily beautified by that roma-glaring sauce. I secretly wished they'd put in more sauce so i could be spared from taxingly scraping the traces off. 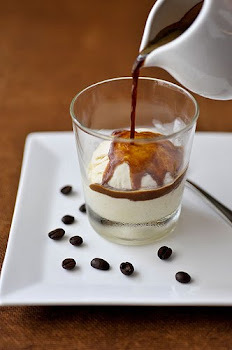 Happily lingered on for a Panna Cotta ($7.90), blob of rich compressed cream drizzled with bitter-blooded amaretto (i love!). Amaretto is veto and no doubt the major player here. It makes the combination superb... just like how 'fresh pasta' drives my optimissism in Pasta Fresca. Let the meesuah bygones be bygones. 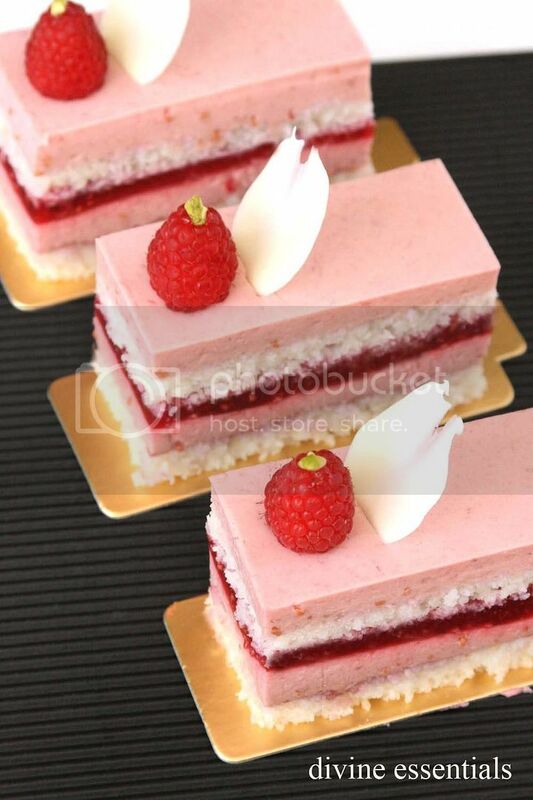 Raspberry Mousse. 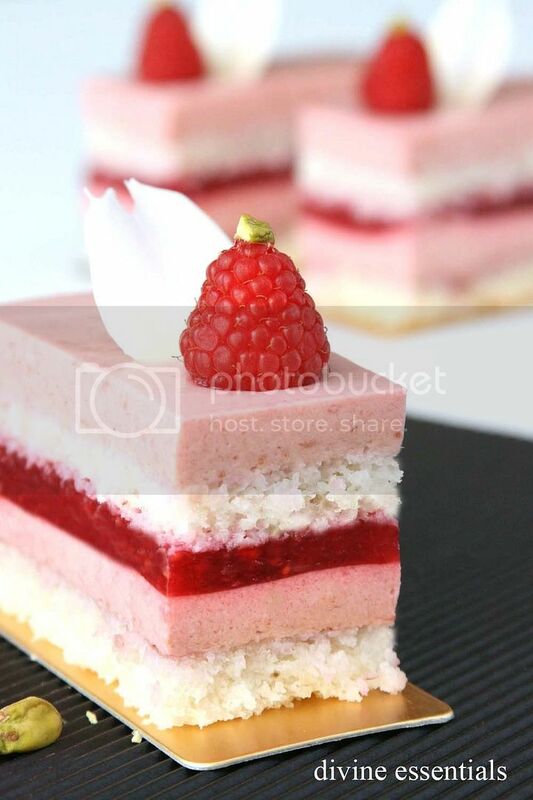 Raspberry Gelee. Coconut Dacquoise. White Chocolate. Pistachio. Pink is alluring. Raspberries are love. With a few punnets of raspberries piled in the refrigerator, i had a sudden idea of colluding them with..... coconut! Imagine. Senses-awakening tartness paired with musky depths of the tropical fruit hmmmm. No use of coconut cream here. I trickled it in through the form of a dacquoise made with dessicated coconuts & a small proportion of ground almonds. The alloy actually turned out softer & airier than regular, replete with coconutty fragrance. 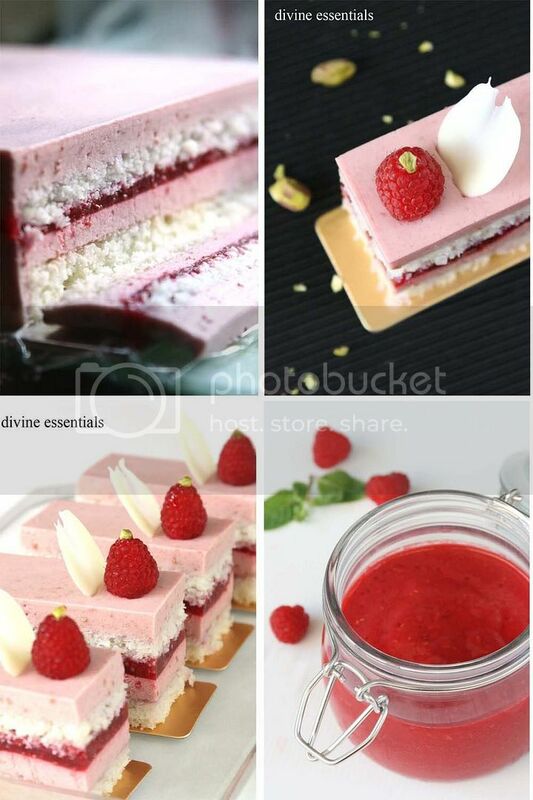 Ever since i started using dacquoise i never wanted to revert to sponge cake dependance anymore. There's so many reasons in it to love: extra texture, fuss-free to prepare, oil-free- which meant less probability of feeling queasy. If you've noticed... i also decided not to strain the berry seeds away, for a verifiable reason. My family is fond of having some nitty crunch in their desserts and retaining them would please the folks better. Try offering them a chocolate brownie vs a chocolate walnut brownie... & you'll see what i mean haha. The combination was palatably genial! If you are highly receptive to coconut transformations (like mummy), or share an undying love for berries as i did... you'll likely not reject this Marriage-in-pink (: A whole load of fresh raspberries invested in there! I discovered a budding Ice3-mimick narrowly five minutes from my place! 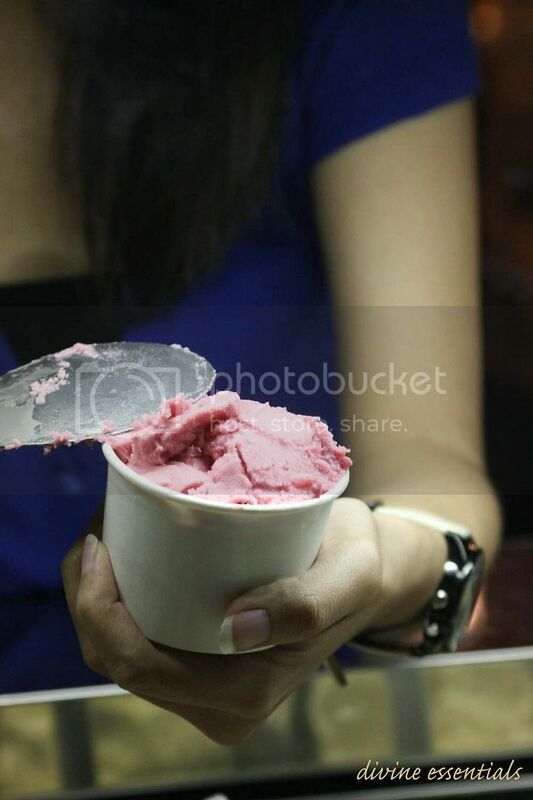 Marvelling on the proximity, i swung by twice within 3 days to get some first-hand icecream coverage. 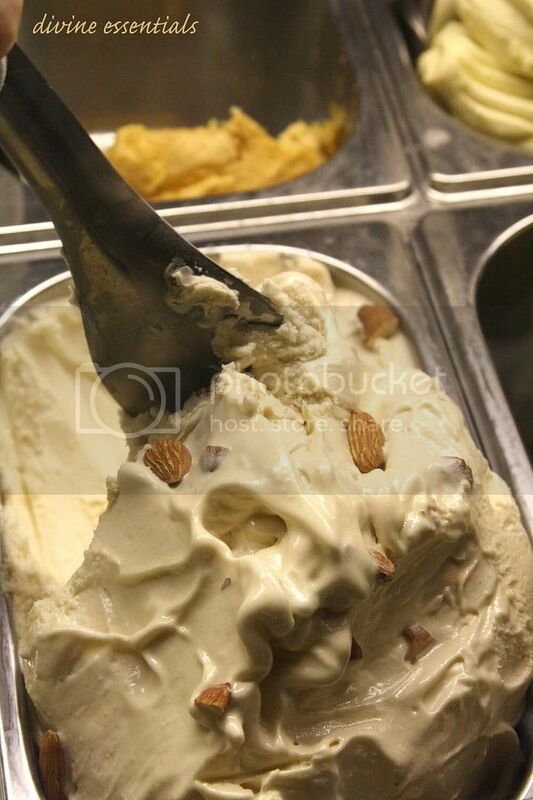 Expect to find waffles, affogatos, finger food & a sustainable range of Y-gen flavours here. I'm definitely more into their milky concoctions than icy sorbets. The vitasoy-resembling Soyabean Milk is prolly smoothest among the lot & had whole almonds thrown in to curtail it's oppressive sweetness. 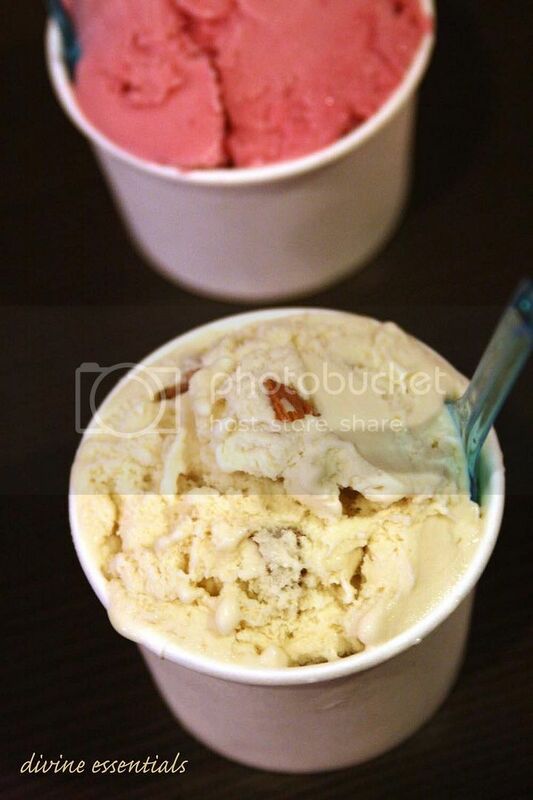 Mango-Passion & Plain Yogurt were closely decent but the Raspberry Yogurt & Green Tea failed to arouse me . 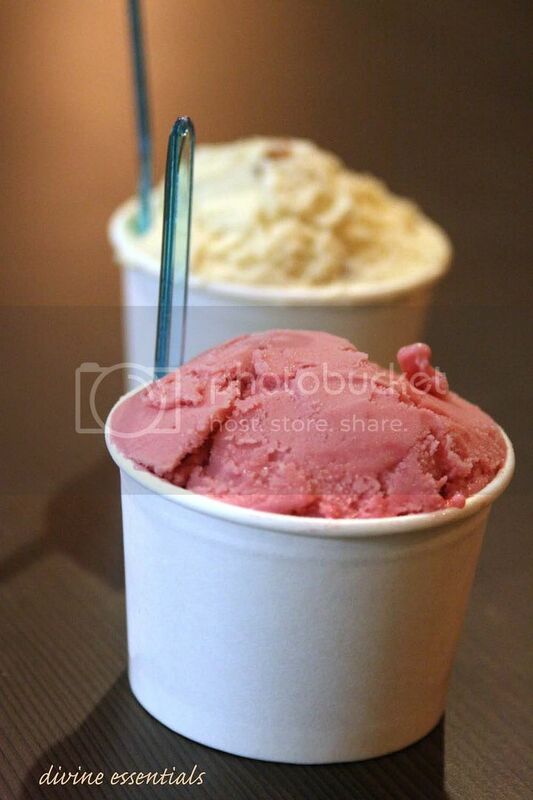 Regular gelato cups are priced at $3.20 each & $4.80 for premium flavours (think Mao Shan Wang). Convenience aside, i felt they had scoopfuls of rough edges to fine-tune, particularly on the unflattering texture. But looks like little needs to be done... cos anything hip+icecream+chillout will automatically plot an ascending graph wouldn't it? The Y-crowd was already fervently rolling in. 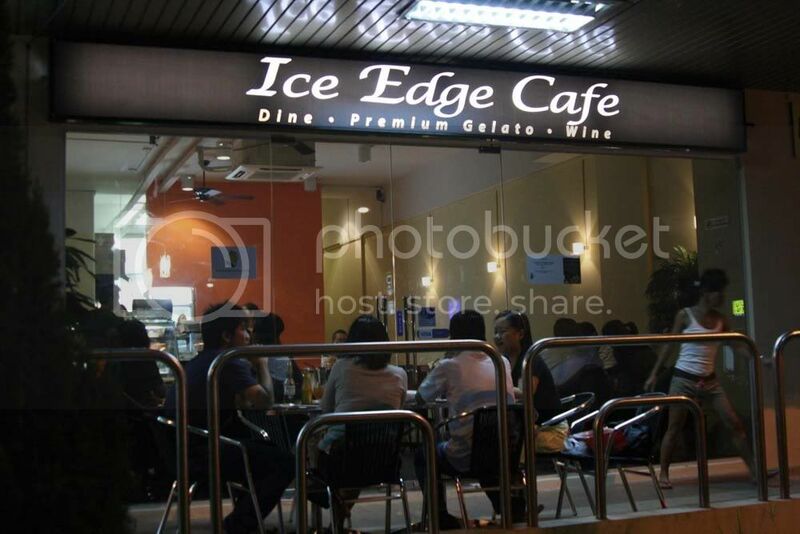 The Serangoonians have Ice3, we Kovanians have our Ice Edge (: Good to have a new chillout haunt but it takes a formidable monster to beat that Ice3 fanaticism out of me. Maybe too formidable to exist lol. This young local-born is a gem. 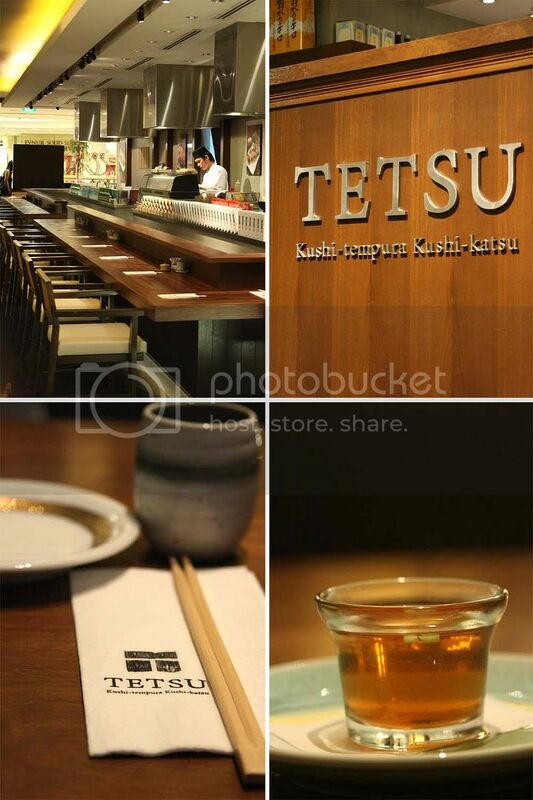 For those who haven't already knew, Tetsu is an authentic kushi-style Tempura and Tonkatsu restaurant burrowed in a corner of upscale Tanglin Mall. 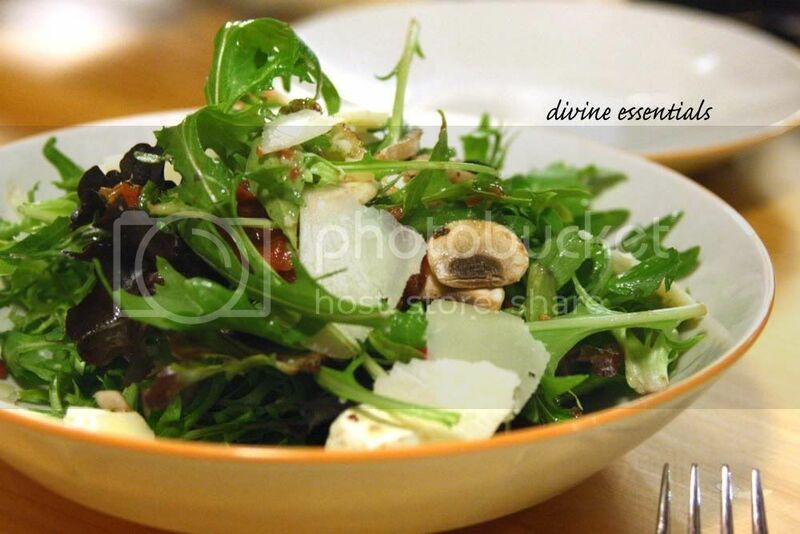 I had a go at their newly expanded menu and was taken in by the pleasant intricacy executed. Eating is believing. Pufferfish for my first time ever. I found myself hooked to the Fugu Mirin Boshi ($10)- dried puffer fish strips 100% safe for consumption. Akin to a softer, classier bahkwa minus the fats and grease (im big on bah kwa you see..). The Kani Tofu ($8) surprised me with its affablity. Im not a century-egg eater but this crabmeat in tofu, smeared with harmless century egg spread, more century egg bits & ebikko studs displayed some plausible innovation. 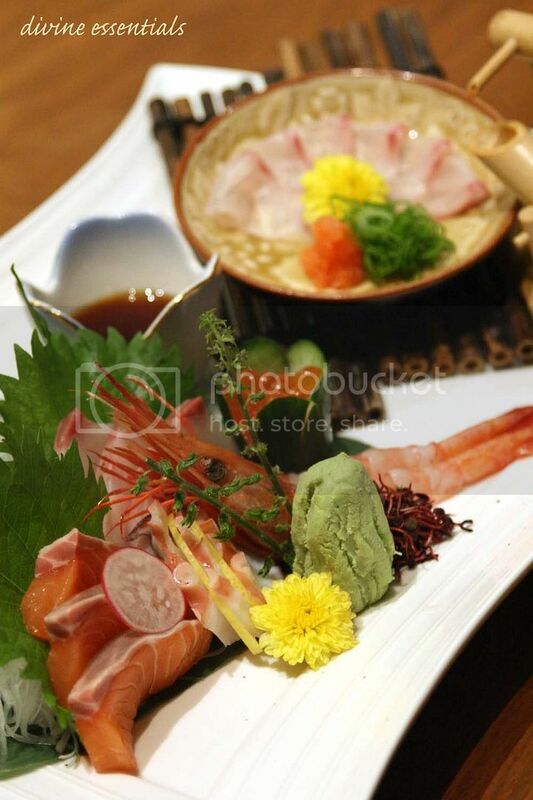 Sashimi Moriawase ($55) was a luxurious showdown. 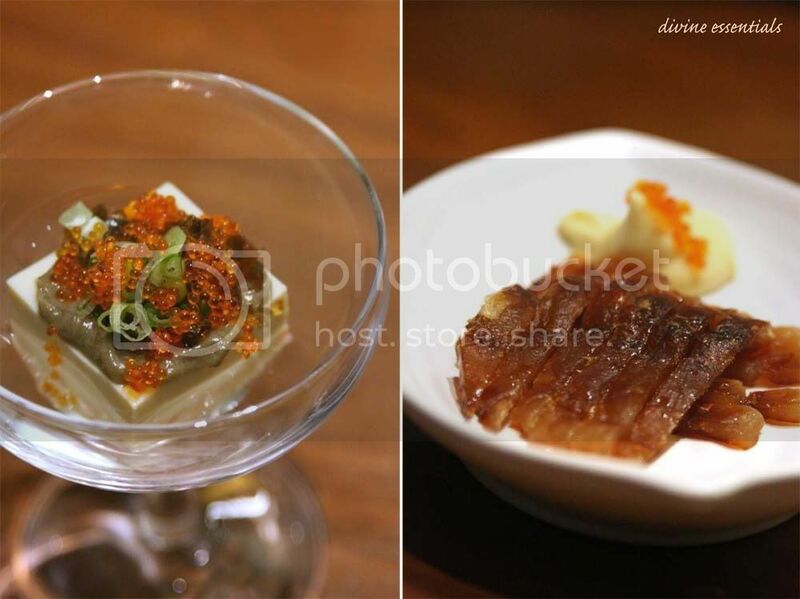 A tasteful selection of sake (salmon), maguro (tuna), hamachi (yellowtail), tako (octopus), ikura (salmon roe), shrimps, and paper-thin tai usutsukuri (red snapper) served with ponzu sauce. Stunning presentation. The ikura was ultra sweet, maguro tender... but salmon could have been better more obese. 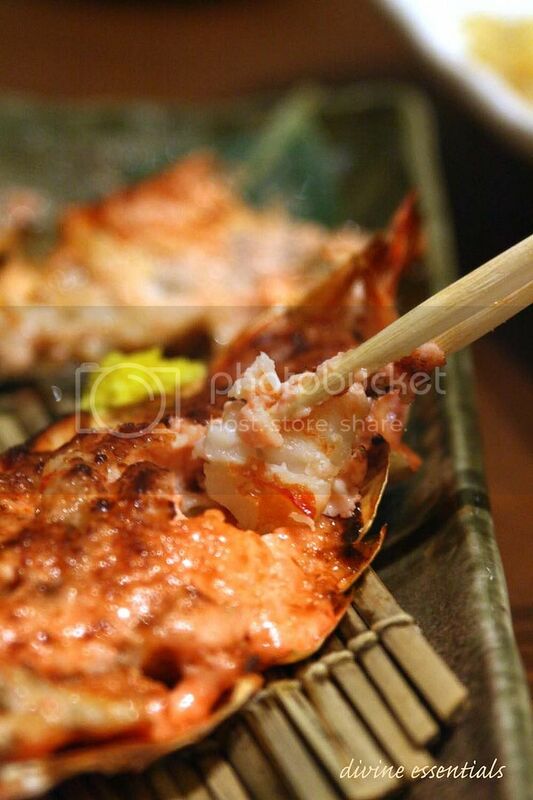 Ahh i enjoyed the richness of Ebi Mentaiko ($6.80 under promotion). The prawn benefitted much from its creamy codroe blanket and grilled to a melty shiokness. 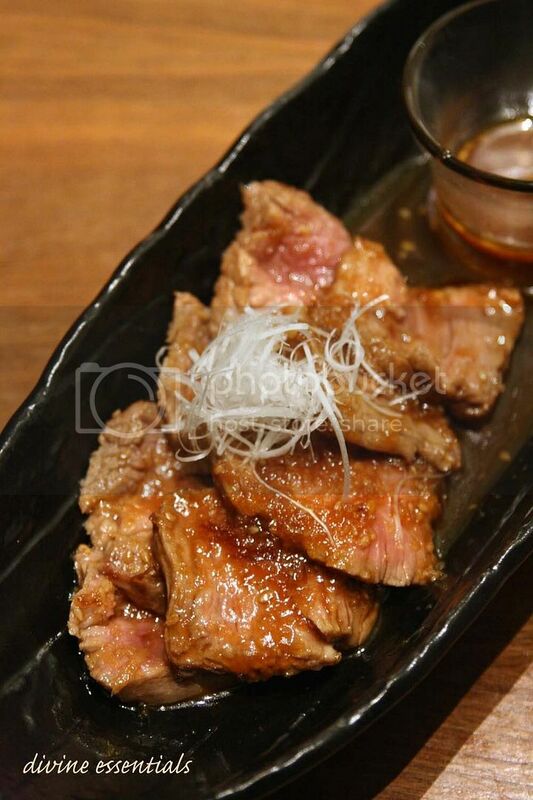 Only one of us had the pleasure of tasting Yaki Niku ($18.50). 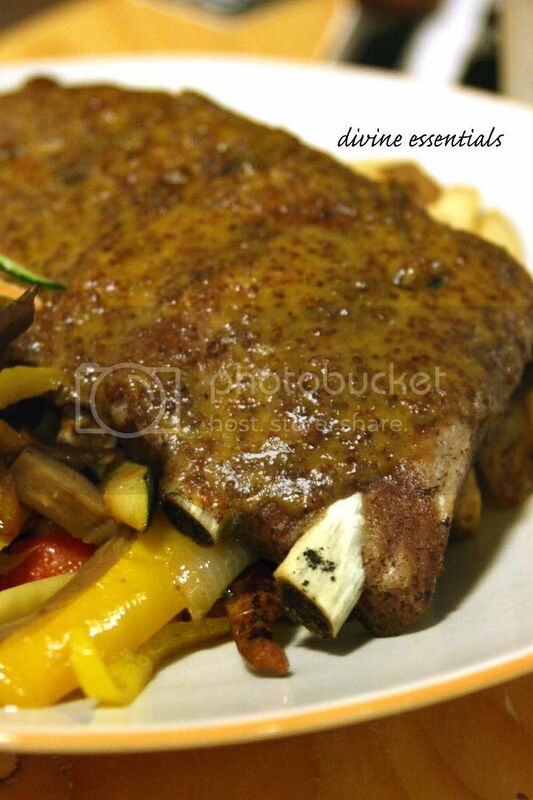 Beef tenderloin soaked in sauce- the restaurant's recommendation for beef lovers. That one fortunate beef-ivore. Sake & Ikura Don ($22). The familiar salmon and delectable (sweet!) 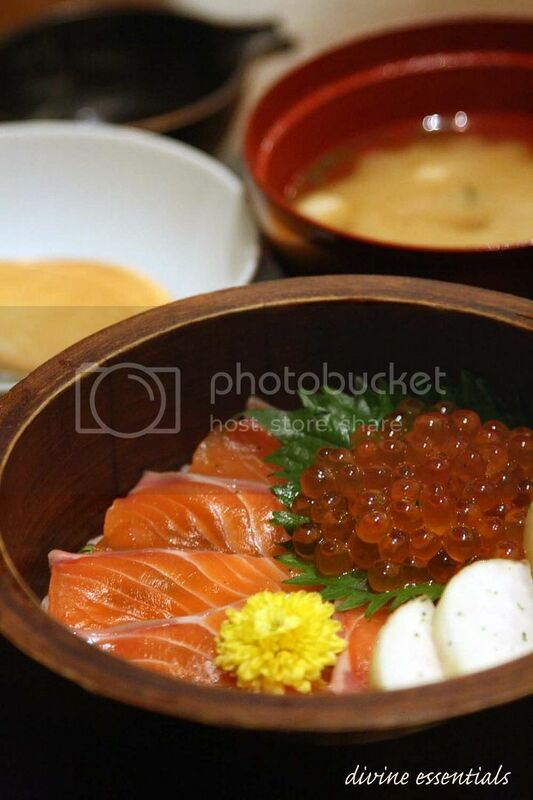 salmon roe spread over sushi rice. Miso soup included. 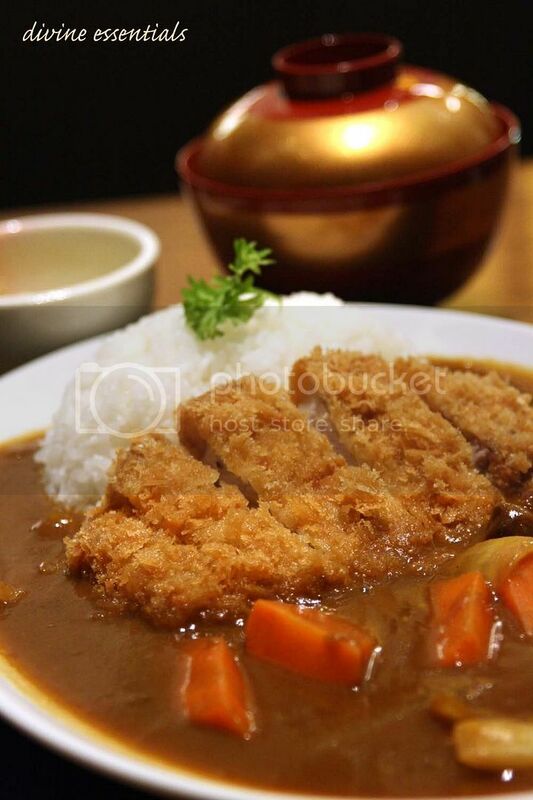 Tetsu's signature Katsu Curry Rice ($16.50) featured a sizeably thick pork loin cutlet swarmed in warm japanese curry. Smooth, comforting curry that's far less overwhelming than the indian forerunners. Rachael mentioned about customers revisting specially for this Hiyashi Udon ($6.80). Don't expect your regular noodles here. 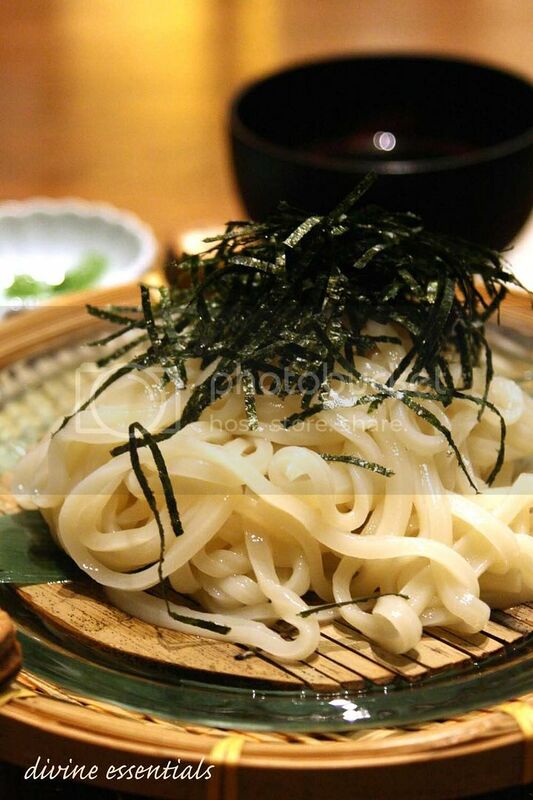 The cold udon is one-of-a-kind, noticeably less opaque and bore a chewy resistive bite. 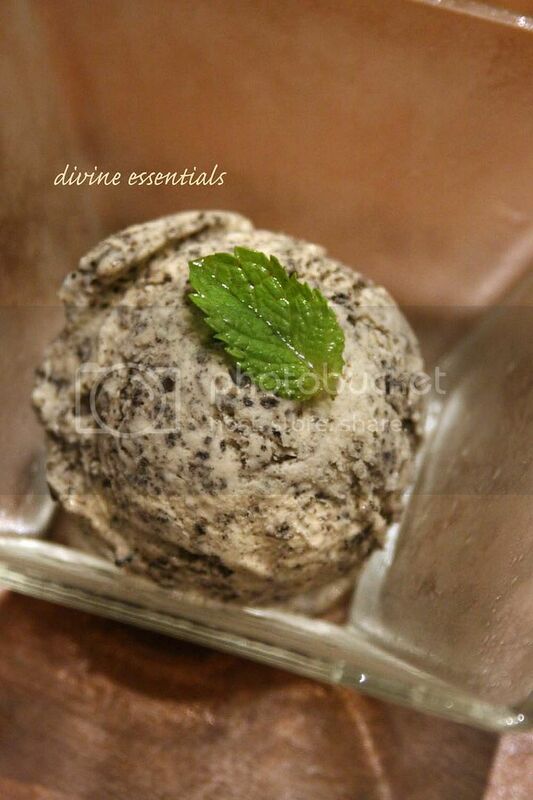 Our tasting rounded up with some of their bestselling icecreams. Jiakasei Goma icecream ($4) fragrant with black sesame seeds and biteable bits of them indeed! 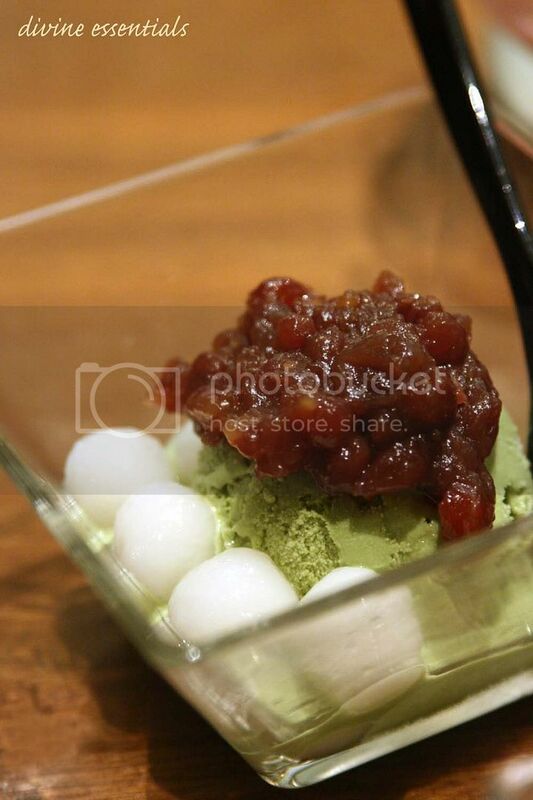 Maccha icecream with azuki & shiratama ($4.80) milky and reeeaaally sweet. 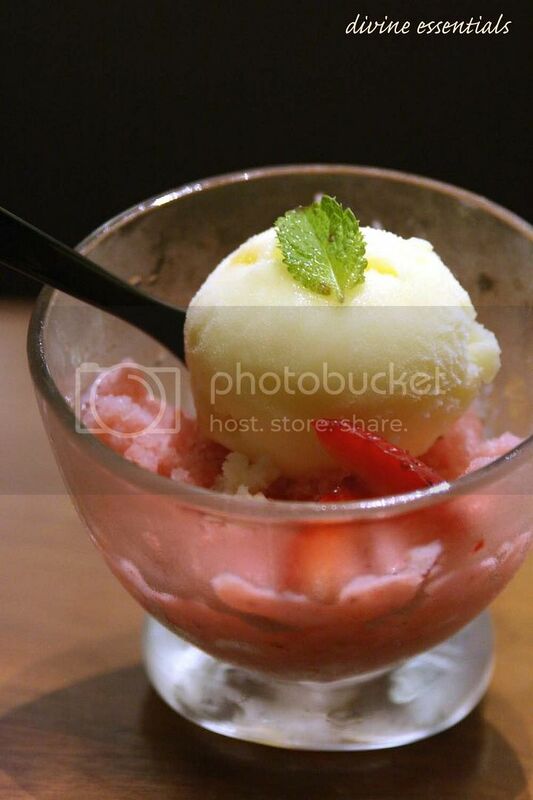 Liked the Yuzu icecream on Strawberry Sherbet best... a subtle fruit pairing to refresh the tastebuds. 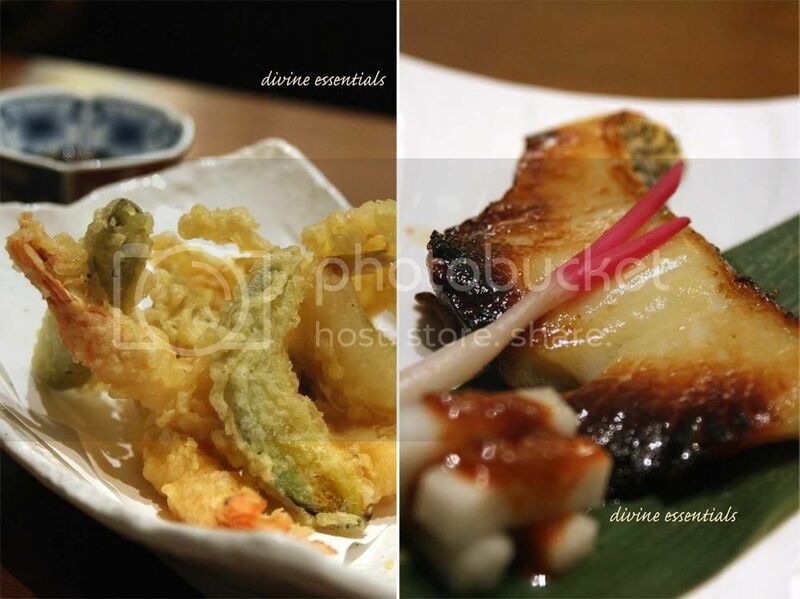 Yuzu works for any after-meal occasion. Enjoyed my dinner greatly. Now given a choice between Sushi Tei and all other comparables, my vote goes to Tetsu for their chef's sincere pursuit of refinement. Commendable service as well. My special thanks to Rachael from B.E.A.M Consultant, Tetsu & Alex for the invitation and making this tasting possible. 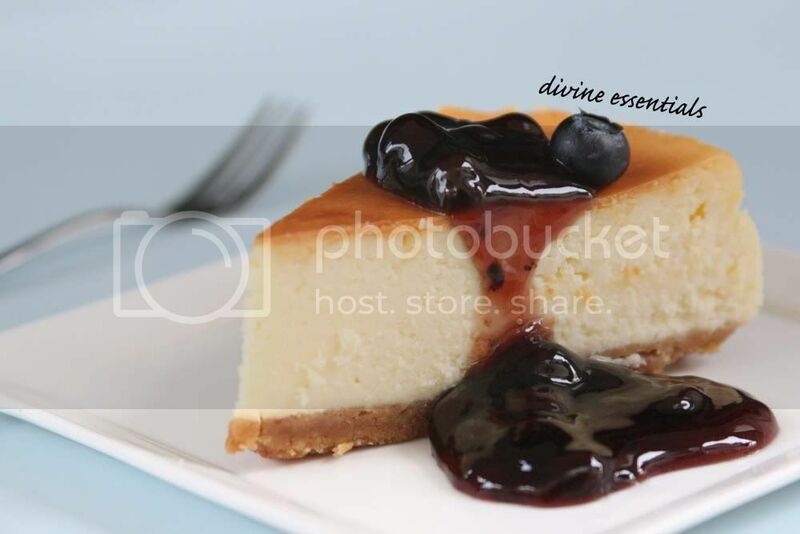 I happen to love cheesecakes unfalteringly. 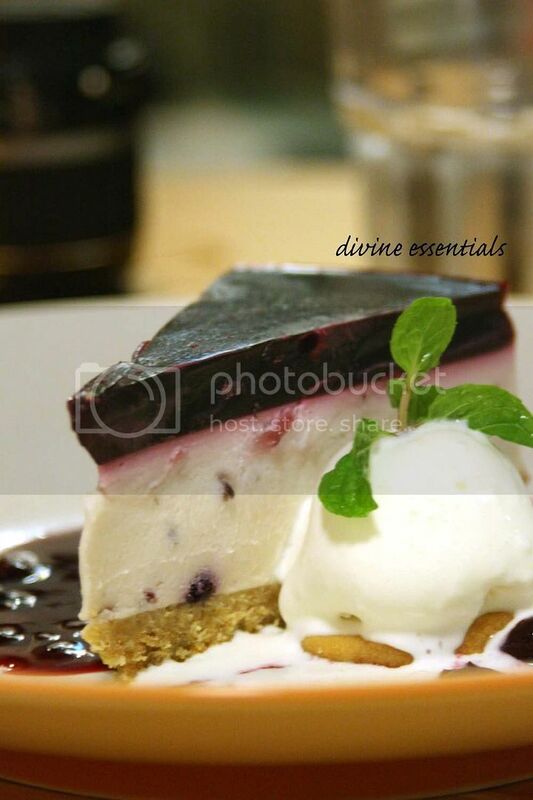 While most people whoop over tons of gooey cheese within their savories, im happier having cheese in my desserts. 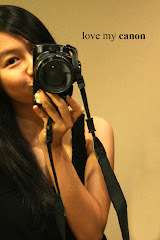 Don't get me wrong. I still sink regularly into pizzas and gratins & their irresistible relatives with no disdain, but the cheesy sweets take me to a higher realm of delight. Here's the original recipe, unmodified. His recipe reacted quite well to modifications so you can try adding your own touches. i tweaked the base's butter-to-biscuit ratio, added walnuts for crunch & adjusted the proportions of some ingredients for mine. Grease and line the base of a 24cm springfoam cake pan. Preheat oven to 180C. Mix the biscuits and butter in a bowl, press into the base of the pan and bake for 10 minutes. Cool on a rack. Turn oven to 200C. Combine sugar and cornflour in a bowl. Add cream cheese and beat with an electric whisk until creamy. Add eggs and beat well. Gradually add the cream, beating until smooth, then beat in vanilla and zest. Tip mixture into pan, level the surface and sit on a baking sheet. Place in centre of oven and bake 35-40 minutes until top is browned and the filling is set around the edges. A piece of foil over the top wihh stop it from browning too much. Allow to cool. Place in fridge for 3 hours or overnight. Put the blueberries in a sacuepan, sprinkle over sugar and add 1 tbsp of water. Put ona medium-low heat to simmer gently for 10 minutes. 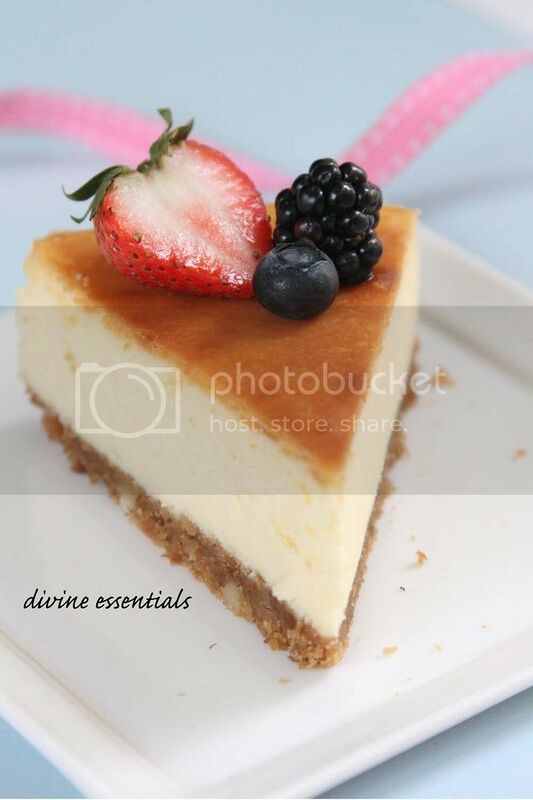 Cool and serve with cheesecake. Rising snooze-free, embracing the sun, heading downtown, choosing Al Fresco, people-watching and chi-chi morning boozes. 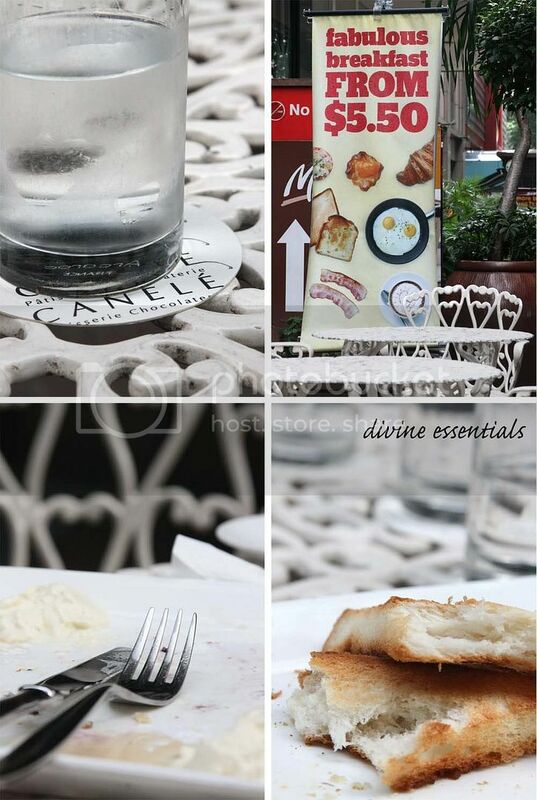 Not to forget, scripting a new chapter like...Breakfast at Canele. 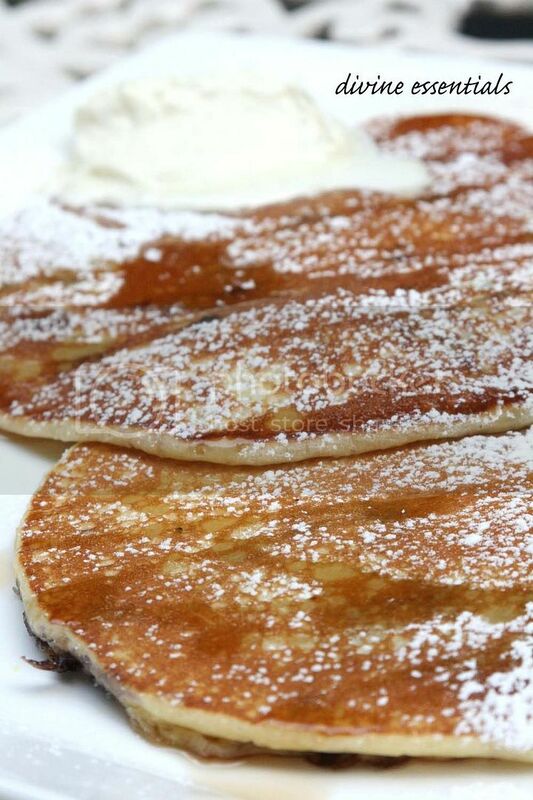 Blue Berry Pancakes ($7.50), looks as if it had endured an unfortunate truck-ranover. Not unfortunate for long. Not when you're flattened over purple berry charms and nursed with maple syrup, creme chantilly & a medicinal dust of icing sugar. everyone's healed. I fluttered off sugar for a 2-Egg Omelette ($8.50), sans yolk, enveloping ham and mushroom nibbles. it's buttery. it's creamy. it's served with snow white toast & oil-glazed salad and shhh.. secretly guilty. My Sunday morning, spent on a dreamy white table & chair.